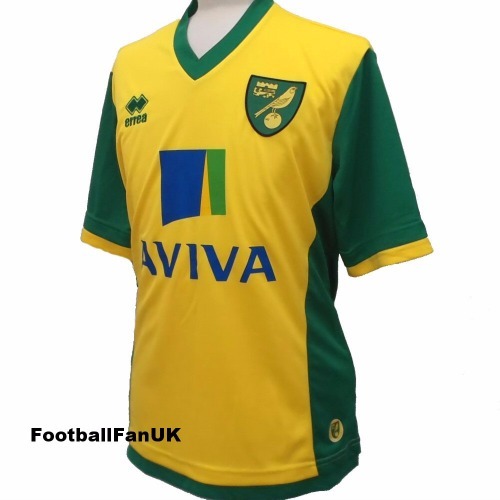 This is an official Errea short sleeve shirt of Norwich City FC, used by the club as their home jersey for the 2013-2014 season when they finished 18th in the Premier League and were relegated after replacing manager Chris Hughton with Neil Adams. New, with tags. We only sell official jersey's from Errea [based in Italy], so you can purchase with confidence. - 'OTBC' (On the Ball, City) woven at back of neck. - Yellow with green trim. - Adult size UK Medium; Chest 42", length 27" . - Adult size UK Large; Chest 44", length 28". - Adult size UK XL. Chest 46", length 30". - Adult size UK XXL. Chest 48", length 31".